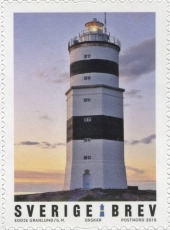 On Jan 4 2018 Postnord issued this very nice set of lighthouse stamps. I apologize for taking so long to post these images. I ordered the set from Postnord but for some reason they never shipped them. 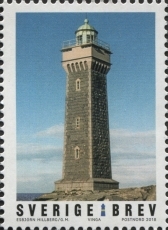 The first two stamps are individual perforated stamps from the large sheet show below. 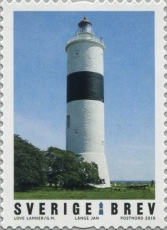 Långe Jan, or Tall John lighthouse is Sweden’s tallest lighthouse an is located in the Baltic Sea on the south end of Öland. 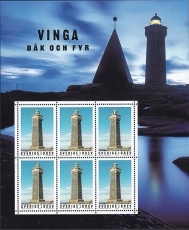 Vinga Lighthouse is located on the island of the same name in the archipelago near Gothenburg. 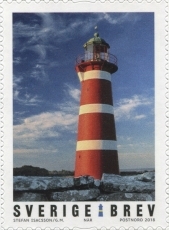 The remaining five stamps are self-adhesive stamps and are available in booklets of 10 stamps. Falsterbro Lighthouse was built to mark the hazardous route near Falsterbro headland. 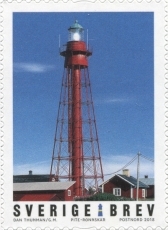 Pite-Rönnskär Lighthouse was built in 1905 and is located on its namesake island. 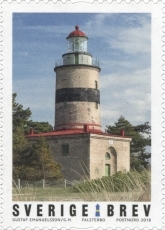 När Lighthouse is located on Gotland Island and dates to 1872. Örskär Lighthouse is located at the southern end of the Gulf of Bothnia north of Stockholm and was one of the first lighthouses built in Sweden. 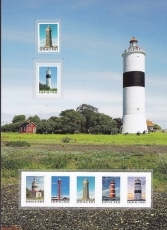 This entry was posted in Lighthouses, Stamps and tagged Sweden. Bookmark the permalink.